A small team in this month as we had to do a lot of moving around Namibia, working in Walvis Bay, Mowe Bay and Luderitz! Lots of sea time and two pygmy sperm whales stranded in Luderitz. 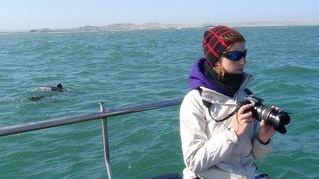 For her MSc thesis at Southampton, Stefanie Rowland used some of our data on bottlenose dolphins in Walvis Bay to investigate the changes in behavior around tour boats.